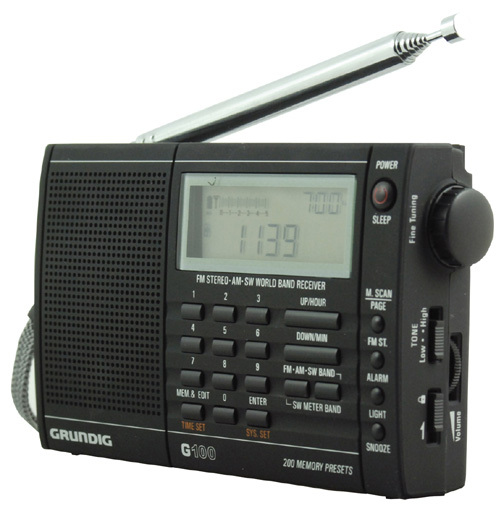 The Grundig G100 is a stylish, compact portable digital radio covering AM, FM and shortwave. It has a black, rubberized finish. You can store up to 200 of your favorite stations. The built in clock has two turn-on timers and a sleep function. FM stereo is provided to the earphone jack and stereo or mono my be switch selected. There is also a Hi/Low tone control. Other refinements include: tuning bargraph, keypad entry, backlit LCD and flip stand. The display can simultaneously show tuned frequency and time. This is a continuous coverage shortwave radio tuning AM, FM and all shortwave frequencies from 1700-30000 kHz. You can quickly change meter bands by just pressing "SW Meter Band" keys up or down. FM reception is 87 to 108 MHz. The G100 may be programmed to personal preferences and geographic location. The controls are easy to operate. Click here to view radio side panels. 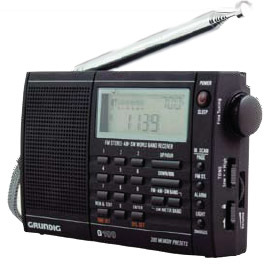 This is a very cool and compact radio at only 4.75 x 3 x 1.1 inches. It is black in color. There is a 3.5 mm earphone jack and 3.0 VDC [] input power jack. 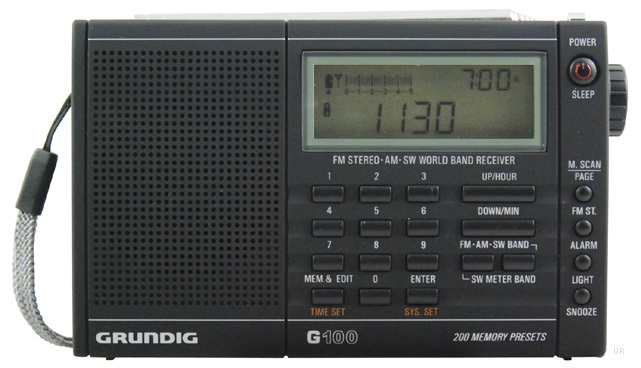 The Grundig G100 operates from two AA cells. Includes wrist strap, protective case, two AA cells and ear buds.